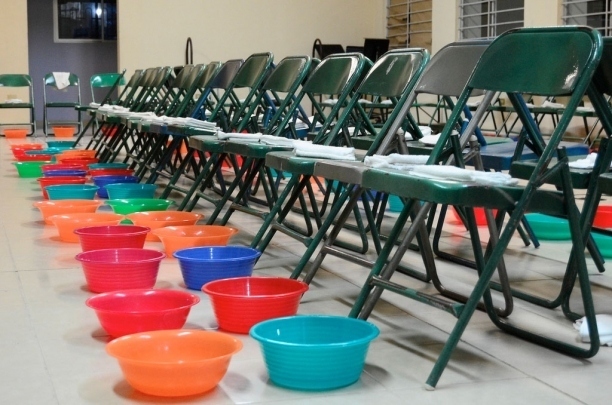 ORLANDO, Fla. --- Tupperware Brands Corporation, parent company of popular Tupperware products, has paid tithe on the first 12 months of a world-wide exclusive foot-washing bowl contract with the Seventh-day Adventist Church. The undisclosed tithing sum will go to support communion expenses for Adventist churches around the world. "As Adventist numbers grow the cost of Welch's grape juice and appropriate wafers is going through the roof, so we are grateful that Tupperware has seen the light," said GC Tupperware Party Director Teight Seel. The footwashing contract makes Tupperware the exclusive foot-washing bowl supplier for the denomination going forward. "Pastors and their staff have received received strict instructions from the General Conference not to cut corners with cheap mixing bowls from the dollar store," said Seel. He added that if Tupperware consents to annual goodwill offerings to the church, the GC might award the company exclusive rights to be the only officially sanctioned potluck container brand. Under the Old Covenant tithe law only those in animal husbandry and agriculture were commanded to tithe. All others were tithe exempt such as people that made a living building houses, making furniture, pottery, clothing, boats, nets, fishing, servants, etc. Why is it when churches and denominations demand tithe they do not exempt these people as well as the poor as God does in the Old Covenant Law? God does not ask for wages or income to be paid as tithe to the church or pastors! Jesus did not tithe. He was first a carpenter then after age 30 he was preacher and teacher. Both professions were excluded from paying tithe. ‍ ‍ ‍ ‍ ‍ Are wacky political candidates exempt too? If so, I’m overjoyed! ASSumed???? Well that explains a lot. Ever heard of Creflo Dollar, Bishop Eddie Long, Jimmy Swaggart, Benny Hinn, Kenneth Copeland, et al? Ever wonder why they’re multi-millionaires with private jets? Because they convince a bunch of little old ladies to give their last penny as a “tithe” to their so-called “ministry” so the little old ladies can receive a blessing. They say, “send me your hard-earned money as a faith ‘seed,’ and God will multiply it and send it back to you.” There’s a name for that: fraud and thievery. Why should “ministers” be crooks? Better leave that to crooked, shady politicians who run fraudulent rags-to-riches real estate schools. Organized religion in general, including independent ministries, non-denominational churches, and the SDA Church, are all based on a common unwritten theme: we have to constantly expand our membership so we can get more tithes and offerings and don’t have to work a real job. Well, I’m a Burny Sanders supporter and I like classical music. Classic hard rock and classic heavy metal, that is. Well, I’m a Donald Dump supporter and I like both kinds of music: Country AND Western! Well, I’m an SDA and I like all three kinds of music: Del Delker, King’s Heralds, and Heritage Singers. I was at a baseball game yesterday, and suddenly a couple of streakers ran across the field. I couldn’t tell if they were male, or female, because they had a bag over their head. Should my pastor turn himself in to the GC if my local church is not using Tupperware? We’re using the cheap dollar-store bowls. . . . Does that mean we will go to Hades? Not necessarily, but you will wish you had gone there. Why are SDA pastors so concerned about “church growth”? Because they want good reviews from the conference president. Why is the conference president so hepped up about church having more baptisms? To build his credentials for a possible promotion to union president, and to bring in new sources of tithe revenue. Why are the union and division presidents so demanding of more and more baptisms and church growth? To guarantee their job security with big streams of income into the Division coffers from a lot of small-time offering and tithe-payers. Why is the GC Prez pushing more evangelism, more baptisms (dunking almost anyone who is breathing)? To expand the G.C.’s market share in the big business of religion and funnel more donations to the G.C. It’s all about money, dude. This may be true, but I prefer to look the other way and not think about it. Hooray for Tupperware. The only suggestion is to make all the bowls white for purity, angelic and pure SDA wholesomeness. Perhaps some enterprising SDA youth can install a musical device into the dishes so as to play a few hymns while the foot washing goes on. I gonna donate all my wife’s unused Tupperware to our local church. We have an assortment of sizes for different sizes of feets or is it foots? PS-will there be Tupperware bowls in Heaven for the communion? Just wondering. I need some assistance in getting back to my room down the hall. Woe iz me!! No problem, Richard. The orderlies in the white coats will be glad to assist you.